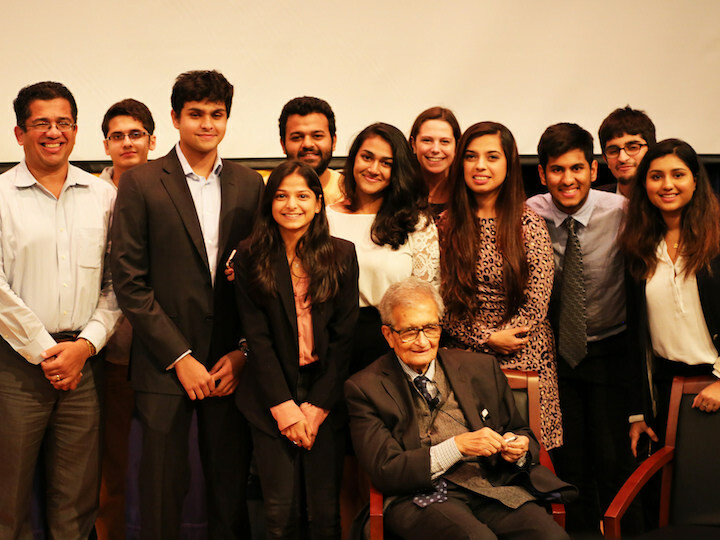 On October 19, the India Initiative, in partnership with the Association for India's Development, hosted a screening of The Argumentative Indian, a documentary about Nobel laureate and world-renowned economist Amartya Sen, directed by Suman Ghosh, a Bengali filmmaker and economist. 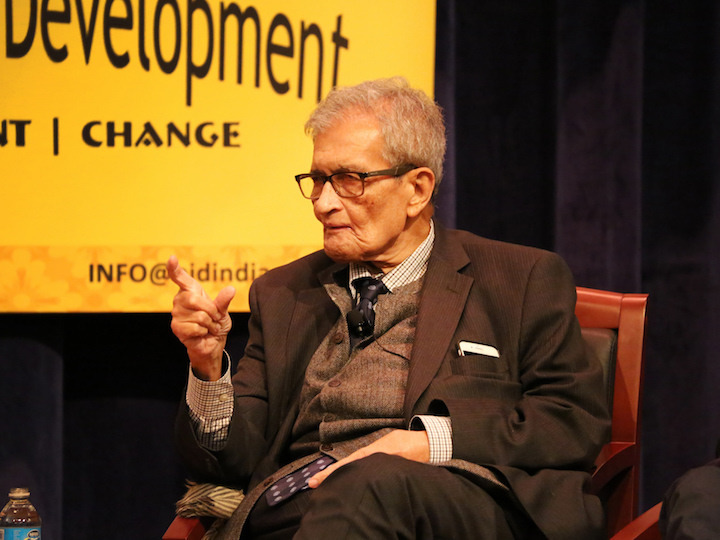 The documentary traces Amartya Sen’s life and explores how the arc of his career shaped his current worldview and impacted his beliefs about social choice theory, development economics, and philosophy. Shot over a period of 15 years, the film follows a series of conversations between Professor Sen and his student, Kaushik Basu. 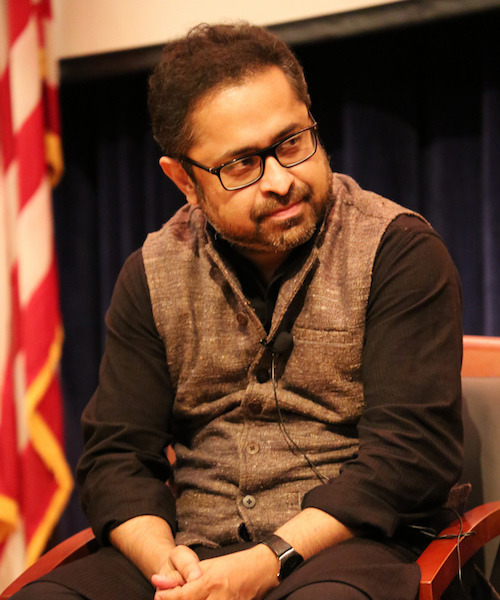 After the film screening, Amartya Sen, professor of economics and philosophy at Harvard University; Suman Ghosh, documentary filmmaker and professor of economics at Florida Atlantic University; and Kaushik Basu, former chief economist at the World Bank answered questions from the audience. The esteemed economists discussed the economics of social justice, community welfare, and how economists can help measure and improve the quality of life for citizens in developing countries. This event was co-sponsored by the India Initiative and the Association for India's Development. Kaushik Basu is a professor of economics and the C. Marks Professor of International Studies at Cornell University; he is the former senior vice president and chief economist of the World Bank. Suman Ghosh is a documentary filmmaker and professor of economics at Florida Atlantic University. Amartya Sen is the Thomas W. Lamont University Professor at Harvard University and a recipient of the Nobel Prize in Economics. Association for India's Development is a volunteer movement promoting sustainable, equitable and just development. AID supports grassroots organizations in India and initiates efforts in various interconnected spheres such as education, livelihoods, natural resources including land, water and energy, agriculture, health, women’s empowerment and social justice.